Are you crisp and delicious? 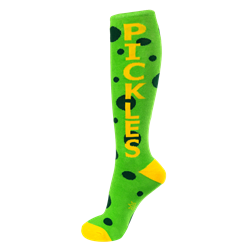 If “yes”, then these knee high dress socks are sure to tickle your pickle. 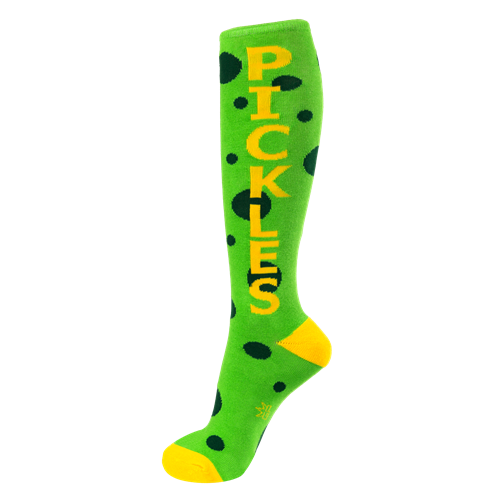 Lime green with yellow lettering and evergreen polka dots, these PICKLES socks will transform your legs, and everyone will be lining up to take a bite. Juicy. One Size Fits Most. 75% Cotton, 17% Polyester, 5% Spandex, 3% Rubber. Made in USA. This is a dress weave knee sock and will fit from a women’s size 6 US to approximately a men’s 12.5 US. Knit in a thinner weave, these socks are best suited for lean to mid-sized legs. They fit to the knee up to about 6’, and wear comfortably with all shoe types. Machine wash cold, line dry.